I first met my spiritual master on March 6th 1975 in Dallas Texas. 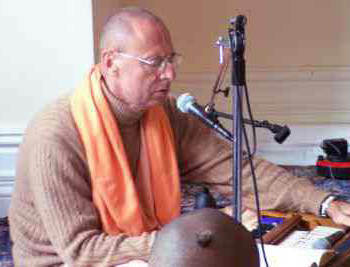 Srila Prabhupada had just been in South America and had toured the Southern United States. I was on travelling book distribution with a sankirtan party and had strayed quite a distance from Montreal my home base. While reporting to the temple president about our scores, we were informed that Srila Prabhupada was flying from Atlanta to Dallas the next day and would be there for some time. We immediately drove west to see with the idea to meet Prabhupada at the airport. By the time we arrived both Prabhupada and his reception of devotees had left. All that remained was a trail of flower petals through the airport. Disappointed we sped to the temple, but by the time we arrived, gurupuja was over and Srila Prabhupada was finishing his talk. I came in the temple room, offered obeisances and saw my spiritual master for the first time. For almost five years I had seen and known Prabhupada visually from photos. His pictures were on the altar, vyasasana, books, magazines, framed on temple walls, in fact everywhere. But I had never seen Prabhupada in person. My first impression was that here was that same photo, but now it was moving. It was such a strong impression, seeing the person I had worshipped in inanimate form for half a decade come to life. Through the rest of the lecture I continued to see Prabhupada in that way. Then I understood that the spiritual master is non different than his picture. That was the first personal contact with his Divine Grace, although I had been an initiated devotee for two years. There were a limited number of meetings with His Divine Grace in the two years that followed. As before our first meeting, so to the present day my association has been more with Prabhupada’s vapu than his vani. It was Krishna’s arrangement. After all Caitanya Caritamrta states “guru krsna prasade paya”, “by the mercy of Krsna one gets guru”. Krsna had arranged just so much association with Srila Prabhupada. It was a perfect arrangement. I have seen many devotees who after countless hours of association with Srila Prabhupada, been his secretary, cook and travelling companion abandon his service and compromise the principles of Krishna Consciousness. Prabhupada had written that one should be careful not to associate too closely with the spiritual master lest one think him an ordinary man. Krsna had protected me. I cannot say I had clearly considered why I was to take initiation from Srila Prabhupada. The temple president said I should and so I composed a letter to that effect. While writing I had a strong feeling I did not know what I was doing. Years later, as I became increasingly aware of what it meant to be a disciple that intuition was confirmed. Although almost 30 years have transpired since I first became aware of Srila Prabhupada the relationship continues to grow and unfold. As Srila Prabhupada had said the relationship between the spiritual master and disciple is a transcendental and mystical one. I can remember as far back as 1970 reading the abridged version of Srila Prabhupada’s Gita. At that time I avoided the purports, thinking that they were simply an interpretation of Krishna’s words. I had thought “why should I accept Swamiji’s explanation, I have my own.” A little later I purchased the first set of Krsna books and began to read that regularly. In time I came to realise that Krsna Consciousness was being delivered by Srila Prabhupada, and that his words were no different from Sukadeva Goswami’s or for that matter Lord Krishna’s. Srila Prabhupada wrote objectively repeating the words of the acarya’s. One day I was returning from the temple via the bus. I remember standing, and reading the Easy Journey to Other Planets I had just purchased. Srila Prabhupada was saying how one should accept a spiritual master and was citing his qualifications. I have a clear impression, holding on to the straps with one hand, the book with the other wondering, “who is my guru?”. Srila Prabhupada was a transparent media. He transmitted complete and perfect knowledge with no personal slant. I accepted the information I was receiving from the book as perfect and yet could not recognise its author as my eternal spiritual guide. It took a few months to realise that Srila Prabhupada was a bona fide guru, a few experiences and another few months to accept that he was my spiritual master. There was an altar in the living room of our apartment where my wife and I offered all our food. Devotees had taught us to make offerings and do a simple worship. The picture of Srila Prabhupada was most prominent. One day while in a less than Krsna Conscious state, I entered the living room . Immediately I was overwhelmed with the feeling that someone was watching me. But there was no one there. When I looked at the altar, I could see Srila Prabhupada’s eyes gazing at me. It did not quite look like a picture, but rather the person was actually there. I ignored the observation and crossed to the other side of the room. Looking once again at the picture it appeared that Prabhupada was now looking in this direction. At this point I became a little uneasy moving about the room to get away from Prabhupada’s gaze. Wherever I went, he seemed to be looking there. I concluded that Srila Prabhupada was aware of everything I did, paid my obeisances and ran out of the room. On another night I had the first dream in which Srila Prabhupada appeared. It was long ago so I cannot remember much. Since then I have had many dreams of his Divine Grace many of which I have written down. the main portion of the dream was that Srila Prabhupada was standing at a distance and waving to me, calling me by name. He was walking forward and calling me to follow him. Srila Prabhupada wanted me to go with him. I woke up “where did he want me to go”. The answers came from within; “to Krsna, out of maya, to ISKCON, to spread Krsna Consciousness”. It became obvious that Srila Prabhupada was making contact with me. On the basis of that contact he was establishing a relationship whether I was prepared for it or not. Srila Prabhupada was entering into my life and would not leave. I made my first conscious step at surrender and began to view Srila Prabhupada as my spiritual master. In 1976 Srila Prabhupada visited Montreal temple for half a day on his way to India. Once again I was on travelling sankirtan and this time in the Maritime Provinces. we received the news a day earlier. There was only two of us. I remember driving down the motorway seeing the driver tired and sleepy. Without stopping we switched places at 70 mph. I was not going to get there late this time. I stayed up all night to build a new Vyasasana. The visit was brief. In the departure lounge all the devotees sat in silence at Srila Prabhupada’s feet. I was foolish enough to speak about the trials of book distribution to Srila Prabhupada, who patiently responded while everyone looked on in anger. At last he said “If it is too difficult you can come with me to India”. I did not know what to reply. Srila Prabhupada was extending a personal invitation. What would I do going to India with Prabhupada. He looked at me. “If you like I will go” I said sheepishly. It was my mistake. I should have immediately taken the opportunity and shown my ardent desire. What did I like to do? But I was duty oriented and the next day the GBC man confirmed that I was better off staying and distributing books. But I should have gone anyway. Coming to Krsna Consciousness was for me, as many others an act of great sacrifice and personal turmoil. I left my wife, dog and a potential career, angered my parents and relations, struck out against the natural course of conditional existence and declared war on Maya. I did not know Krsna, I understood little of the philosophy and the way of life was foreign. But I had firm faith in Srila Prabhupada and I followed him. Srila Prabhupada was everything. He was the spiritual master, visionary acarya, empowered preacher, head pujari, expert cook, father, friend, and only via media to Krsna. Everything I had left behind I reposed in him. In fact Srila Prabhupada was my life. Then in 1977 he just left. I cannot say that Srila Prabhupada had not given notice. Even as early as 1966 he had said “my time has come, I am an old man and can die at any moment”. But I, like many others did not believe that Srila Prabhupada would go. Mainly I could not conceive of living, what to speak of Krsna Consciousness without him. I was in the temple in Chicago room chanting my rounds before the deities. It was after the morning program and my day off from sankirtan. Someone came downstairs and asked me to come up into the temple president’s office. I did. He told me of the telephone call he received with the news. I just sat down on a chair. I think I must have sat there around eight hours. I was in a state of shock. In my mind I was just trying to comprehend what it meant that Srila Prabhupada had left. How was there such a thing as Krsna Consciousness without Srila Prabhupada. How was there a world without Srila Prabhupada? Most seriously how would I exist without Srila Prabhupada’s presence. It is true that my association with Srila Prabhupada was limited. However I was always secure knowing that he was somewhere on this planet, somewhere as the ultimate authority to resolve any controversy, somewhere I could go if I needed to. Where was he now? Almost twenty years have passed and I have reconciled that the search for Srila Prabhupada is within his instructions, his books and within my heart. Gradually I am learning to appreciate that it is vani which is the eternal link that I am being forced to embrace. Srila Prabhupada has given in his dedication to Srimad Bhagavatam. “To my spiritual master Srila Bhaktisidhanata Saraswati Thakur, he lives forever by his divine instructions and the follower lives with him”. If I want to live forever with Srila Prabhupada I must abide by his orders. It was not my choice, but rather his will. Srila Prabhupada could have stayed had he desired. He did not. The next generation of devotees has come and there will be more to follow. Devotees who never met Srila Prabhupada in person, devotees who did not go on morning walks, sit in lectures or wait for Prabhupada’s arrival at the airport. What remains for the future? As I, so others can continue to know and live with Srila Prabhupada by following his instructions. In that attempt one must be intelligent and sincere. There are already deviant sects who in an attempt to immortalise Prabhupada, go against his teachings. Srila Prabhupada desired we maintain the integrity and siddhanta of our parampara. He wanted devotees to preach conjointly to spread Krsna Consciousness all over the world. Srila Prabhupada wanted books translated and distributed, temples and deities, varnasrama and festivals and most of all pure devotees. Followers of His Divine Grace should make his desires a reality in Hungary. In that way as he lives by his instructions, we will live together forever with him.